Sir, It was at the age of 12 that I came to know him. More because of my elder brother than as a swimmer. My brother who was an inter-college contestant then is also on more. I used to follow them to huge pond known, in those days of near archaic English as tanks, with a very long rope and a wooden scale in hand. The pond was known as ‘Jatin Daser Dighi’ and was situated near the Ganderia Railway Station. We used to live in Ganderia. So we used to measure the length and multiply them as Brojenda went on paddling like a swimming machine 20, 30, 50, and hundred lengths on every afternoon in the great tank of Jatin Das. Little did I know then what this arduous workout would bring from him, later he conquered the English Channel. My interest was to look up in awe to a man who was more of a ‘merman’ than a human being. Not that I was not rewarded for my labour by Laddoda. He taught me the six-beat free-style crawl later converted to the Australian eight-beat crawl and I used to keep paddling across the Dighi for hours on end on weekend morning. This I did because Laddoda had told me that I could some day become a great long-distance swimmer. That I finally failed to make it there was because of my own tardiness. There was one other more immediate reward that Lkaddoda offered us. A weekly refreshment at a restaurant in Farashganj. I remember that particular day when Brojen Das had steamed his way to victory in the 100 meters free-style contest in the Pakistan Olympics held at Dhaka beating a much vaunted and colossal Muhammad Ramzan of the Pakistan army. He created a Pakistan record that could not be broken at least we became Bangladesh. I met him very rarely of late, that too when we felt like coming down to the Gym that I occasionally use for my workouts. It did never seem that 40 years had gone by since I was his disciple. He would greet me by my pet name and ask about the well being of my family and me. He would still lament over the fact that I had not made a swimmer. Laddoda, you are no more, buat a whole generation of Bangalees would remember you with pride for as long they live. We will miss you forever. 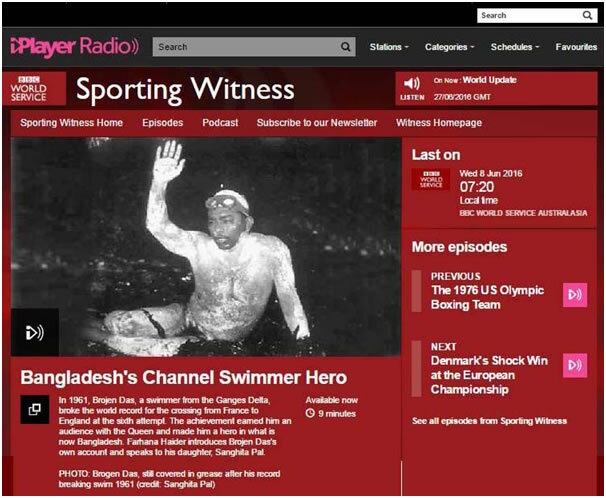 BBC World Service broadcasted a radio program on Brojen Das in the sporting witness section. The program can be heard by clicking this link.